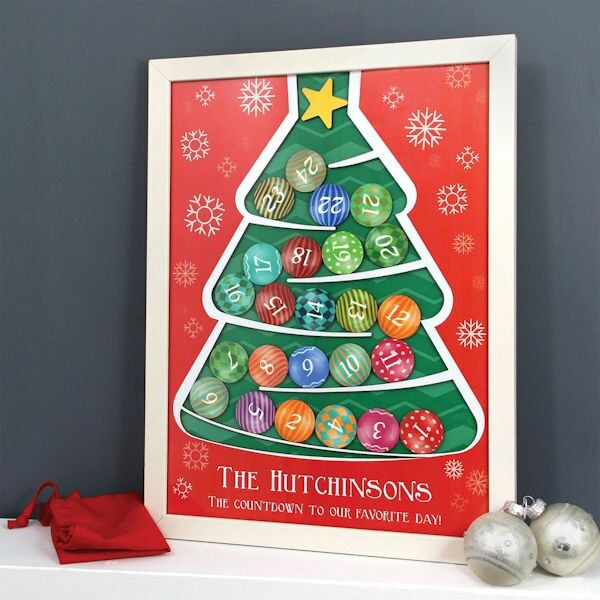 Make Christmas even more exciting with an Advent calendar you'll use every year. A white-painted wood frame holds a cut-out Christmas tree under Plexiglas®. Inside a red drawstring bag are 24 round laminated tokens numbered 1-24 and a bright yellow star. On December 1, drop the token numbered 1 through the slot in the top. Each day from then on, drop the next numbered token through the slot. The tree fills with ornaments until Christmas morning, when you add the final token: a star. Handmade and delightful, this calendar will become a family tradition and a treasured keepsake. 14"w x 18"h x 1"d. Specify two lines of personalization up to 25 characters each, including spaces. The phrase shown "The countdown to our favorite day" is not included unless you specify it as your second line. Allow 3-4 weeks. No rush delivery or gift box.